The village of Lympstone lies on the banks of the River Exe estuary and boasts four pubs, a cafe, post office and fish store. The sunny garden at the rear of the Redwing. There are three pubs within a five minute walk of the house which all serve good food. The Swan (01395 270403), The Redwing (01395 222156) and The Globe (01395 263166). 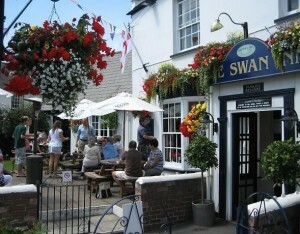 We can offer you a 5% discount voucher for the Swan. About 15 minutes away is the Saddlers Arms which can accommodate large parties at reasonable prices. There is also a large garden and plenty to occupy youngsters during the Summer. (01395 272798). Both the Redwing and the Swan offer beer gardens for dining al fresco. The Puffing Billy at Exton (5 minutes by car) or a 20-minute walk along the cycle track, is also excellent (01392 877888). We would recommend you book just to make sure. The Turf Locks Hotel has extensive gardens alongside the river and canal. The Hotel is on the opposite side of the estuary and is only accessed via a footpath, cycle route or by boat. You can take a ferry from Topsham to the Turf, or catch a ferry from Exmouth and walk or cycle the three miles from Starcross to Turf. The hotel is only open on the Summer season – Easter to September – but has an excellent reputation for good food. There are large gardens to relax in alongside the Exe estuary and the picturesque Exeter canal. The River Exe Cafe is relatively new to the River Exe but is attracting a huge following with visitors travelling from around the country to sample the excellent food in unique surroundings. The cafe (only open in season or by special request) is situated in the centre of the estuary with views over the coastlines of East Devon and Teignbridge. Fisherman Jason Ingham with his boat the Compass Rose provides the village with fresh, locally-caught fish. Depending on the tide and weather conditions, the village’s fish store has a range of fresh catches for sale. Jason will be pleased to fillet your fish as you wait. The nearby town of Exmouth also has some fine eateries, including Les Saveurs in Tower Street where the owners Olivier Guyard and Sheila Guyard-Mulkerrin were voted Top Restaurant after a TV contest called Kitchen Wars run by Marco Pierre White earlier this year (2012). There are also many other top restaurants including a national award-winning fish and chip shop – Krispies in Exeter Road. Every year on the first Saturday in August the village celebrates the Furry Dance when tradition states that fish were exchanged for furs from North America. The village has many organisations and clubs and has a number of thriving youth groups such as a Junior Tennis Club, Scouts, Cubs, Beavers, Brownies, Football and Sailing. The Lympstone Sailing Club stands alongside the village’s boat shelter and at high tide is a hive of activity. At weekends and on sunny evenings the village is kept busy with visitors on foot and on bikes as families and individuals from Exeter and Exmouth make use of the new cycle path which runs alongside the estuary. It is possible to complete a circular course from Lympstone to Exmouth and over to Starcross on the ferry and then along the estuary towards Exeter with stops at the Turf Locks Hotel or further north at the Double Locks public house. Both offer extensive menus and real ale. Cyclists and walkers can cross the river at Countess Wear and make their way towards Topsham for the return journey along the cycle path to Lympstone. A shorter route would be to catch the Topsham to Turf ferry (Tides permitted) and return to Lympstone from Topsham. If your legs can do with a rest you can always catch the train from Topsham to Lympstone Village.